When you’re working on a project, the flooring can easily send your budget over the top. You want to leave more funds available for decorative touches and high-end materials in other areas, so you’ll want to save wherever you can. You may think that the most affordable floors involve vinyl or laminates, but this couldn’t be further from the truth. The fact is that you can easily dress up your project with decorative marble that’s affordable today and cost-effective in the long run. Before you choose the final flooring material for your project, here’s what you should know about natural stone options. One important consideration is the look of different materials. While there are vinyl substitutes that mimic the look of natural stone, they don’t quite have the depth and true colors that you’re looking for. The fact is that natural stone simply stands out from the competition, and manmade materials don’t quite compare. Ideally, your flooring will last for a decade or longer, so you want to choose a look that you can love for a lifetime. 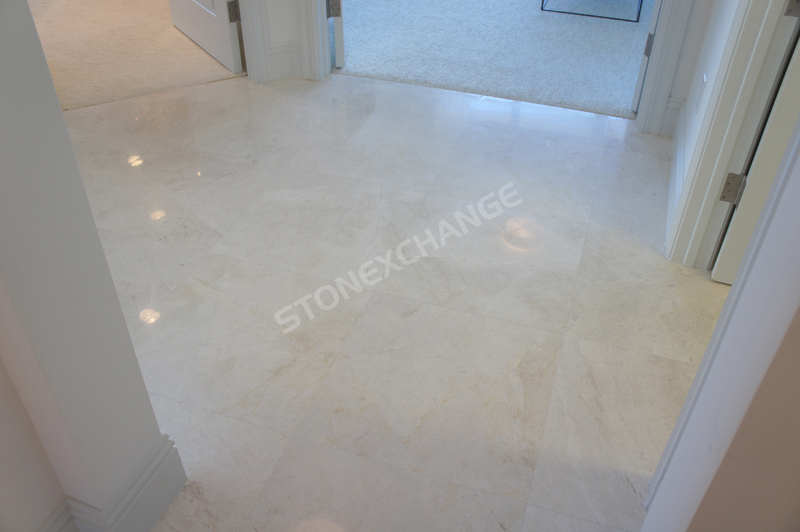 While the synthetic versions may not quite meet your high standards, you can bet that the genuine stone flooring will be a source of pride for you for many years to come. You may find that the small premium you pay today is well worth the long-term benefits and beauty of natural stone floors. You’ll save a good deal of money over the life of the home because this may prove to be the last floor that will be installed in this area. Synthetic materials are always hot because you can choose the trending colors that aren’t normally found in natural stone. While this may be a great idea for accessories and perhaps even a backsplash, you want to go with a more neutral finish for something as large and costly as your kitchen or sunroom floor. Natural stone is one product that will never fall out of style. It simply never grows old, and it goes with any decorating style. Whether you’re going for a modern finish today or something more traditional, a beautiful white marble will look incredible. The best part is that the design can be changed in future years by other homeowners, and the flooring will still blend nicely and add an elegant touch to the space. As long as it receives a little care and attention along the way, it will provide you with years of service. This means that you’ll save money in the long run by being able to continue using the flooring through countless design themes. Thin ceramic tile is more prone to cracking, and wood floors can be scratched and will warp under damp, humid conditions. Vinyl has a terrible reputation for durability because it can rip when appliances are moved, and laminates can swell and become damaged if they get wet. Marble, travertine and coral stone tile aren’t prone to any of these challenges. The natural stones are forged by nature through incredibly difficult conditions, so they’re some of the most durable materials around. They can be used in outdoor and indoor applications, and they’ll last through years of normal use. Even if you’re worried about spending more on the flooring today, it’s important to remind yourself this this floor will outlast almost every other material. In addition to saving money on materials down the road, you’ll also save on removal and installation costs later. At the end of the day, you do have to look at the initial cost and weigh it against the benefits and your budget. While you may be committed to buying marble, you may find that most retailers are simply priced out of your budget. However, there’s an easy way around this dilemma. You can order certain colors in bulk through our wholesale company to get the tiles you need and save money. If you’re working on numerous homes, then go with a neutral color that can be used across the properties. You can also use the same color scheme in the bathrooms, kitchen, and dining areas of a single property to increase the order size and bring the overall cost down. You’ll wind up with the same incredible quality stones, but your initial outlay will be a fraction of the price. The best part is that this simple idea doesn’t have to require going with a basic white Vanilla Oro stone. Arizona Ivory travertine is one tile that looks amazing in any application, yet it features incredible colors that are attractive and timeless. You’ll get the high-end look you want without the high-end price. Another easy money saver is to go with a company that can deliver the stones right to your door. Not only will you avoid the hassle of driving to the store and loading up your truck, but you can search for great deals all over the country. After you’ve looked for better prices, come to the team at Nalboor for excellent quality and wholesale rates along with incredible customer service. We have highly skilled customer service representatives who will help you choose the right colors and sizes for your project. We’ll then walk you through the ordering process to ensure that you’re getting enough tiles for the work. You’ll save money, and you’ll avoid the frustration of picking up your own order. Our goal is to provide you with the high-end flooring you need at a price that fits your budget. They say that you get what you pay for, and this is certainly true when it comes to flooring. You can choose cheap products that cost next to nothing, but you’ll have to replace them in a short time. They also make it harder to sell a property that’s being flipped. Natural stone is well worth the extra investment, but you still should take steps to save money on this material. Contact Nalboor today and see how nicely our wholesale prices will fit in your budget. We carry the most popular colors that are in high demand with designers and contractors alike, and we’re ready to fill all types of bulk orders so that you can keep your project on track and in budget.